The week before we left, all kinds of things happened, not directly related to us. First, there was a rain storm that dropped lots of water on the salt, but with a little searching, the officials were able to find a dry patch big enough to run. Then, a fire in the storage lot burned much of the association's equipment. 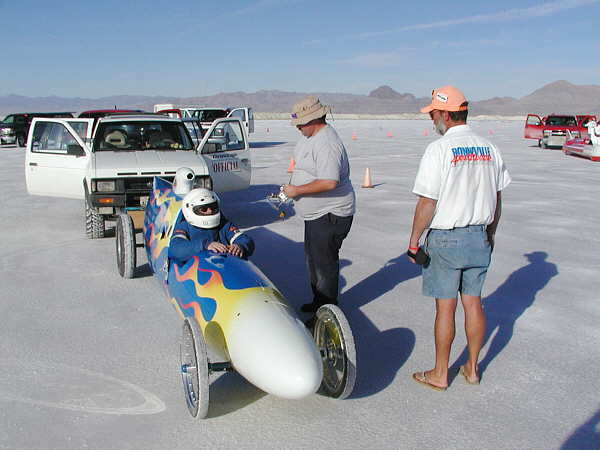 The biggest losses were the marker cones and the wire used for the timing sensors. Again the officials sprang into action and begged borrowed, rented or stole what was needed. With only a couple of days to work in, they did a very good job of acquiring everything it took to keep the meet going. Great job Roy and company. 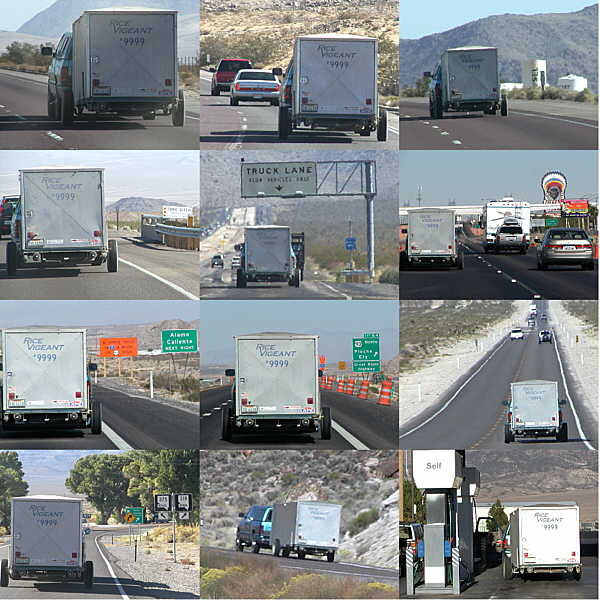 Extra bonus points for anyone that can recognize where each of these shots was taken. 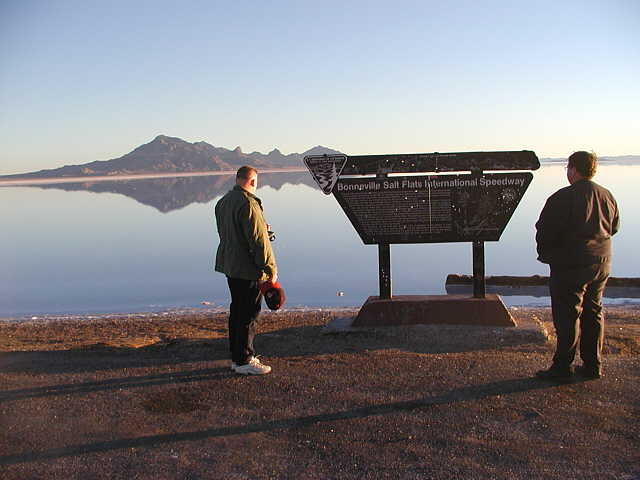 We arrived at Bonneville Sunday night to find water as far as the eye could see. 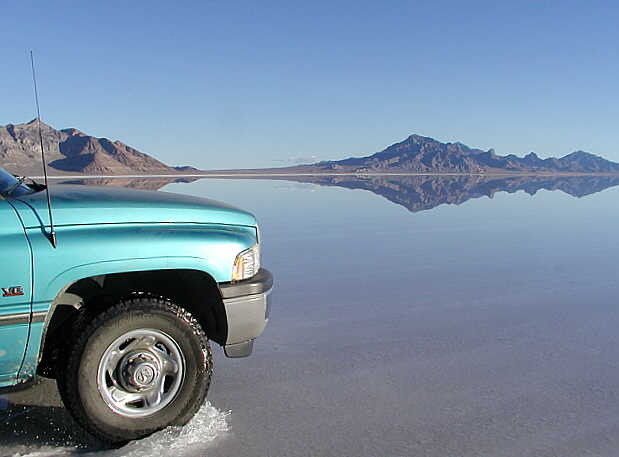 If you ever wondered what Bonneville was like in winter, it’s a lake, here's proof. My first thought was that the meet was canceled, but I was assured that somewhere out there, was a patch of dry salt. Gingerly, we headed out into the lake. We idled along for a mile before the water started to give way to wet salt, then eventually dry salt. 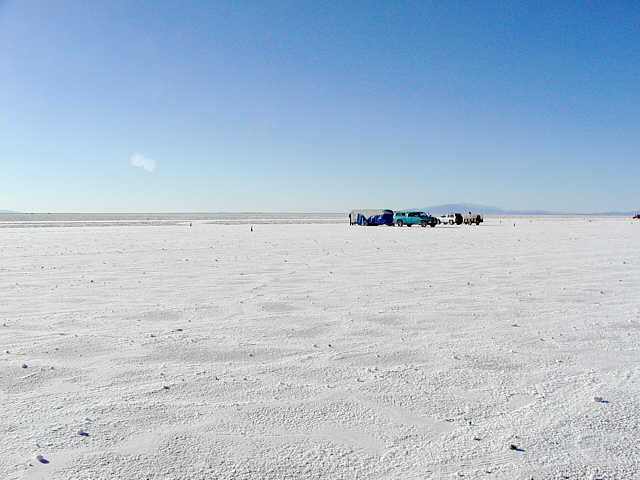 Once we got to the pit area, there were no traces of water, and the salt was dry and hard. Unfortunately, it was also bumpy. To find a dry area, we had to race much further East than normal. That meant rougher salt, which meant that everywhere anyone was going to drive had to be plowed with a salt drag. On the plus side, at least you could tell were the "roads" were, even without the cones. 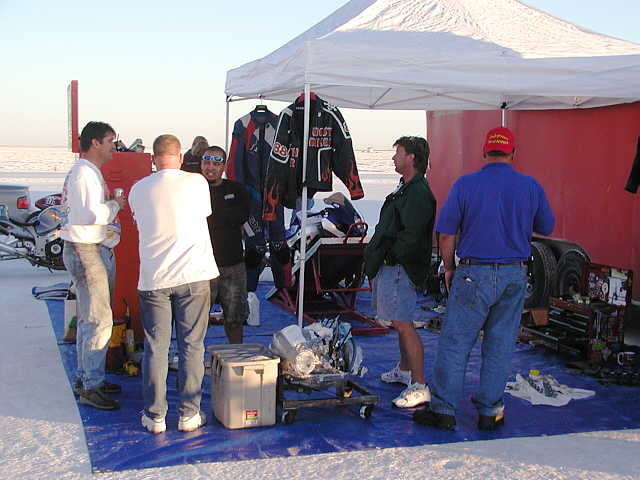 Since we got out before the timing tower, We couldn't setup that equipment, so we started setting up our pits. It turned out we were the first ones there. Being used to the crowds that normally fill the pits, this was a little spooky. One interesting thing that happened Monday morning was that I found out a photo I had shot at SpeedWeek in August had been used for the World Finals Press Pass. I had sent the photo to Carl Heap, the owner/driver of the Phoenix and he had passed it onto to the association, (with my permission). It was quite a thrill all week long to see professional photographers wearing my photo. 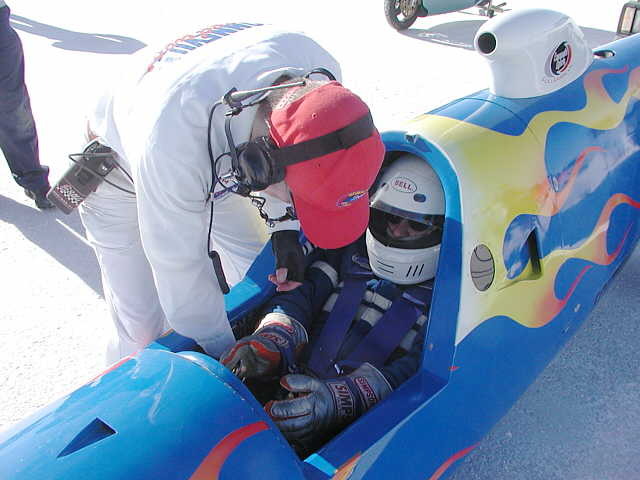 Alan, Mark, Pat, and I spent Monday and Tuesday alternating between setting up the timing system and readying the car. By Tuesday night, both the car and the track were ready to go. Wednesday Morning the race started, with Mark making three passes. 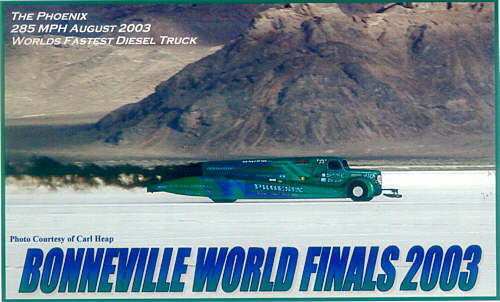 all ended at 199 miles per hour. We were trying for 206 which would have been a new record. We tried changing several things but always got the same result, When the engine hit about 8300RPMs in 6th gear it lost power. Checking the data computer we found that one cylinder would drop out near the top of each run. Swapping electronics and other things didn't help, and Thursday, Alan made two runs, the fastest was 199.7 mph with exactly the same problem. Friday Morning, I, (James) made a run, with the plan that I would hold the car in 4th gear to try and force higher RPMs. Well I ended with a 189mph run. My fastest ever, but still a disappointment since the car should have been running better. The decision was made to pull the head of and replace it with our higher performance one that had just arrived. 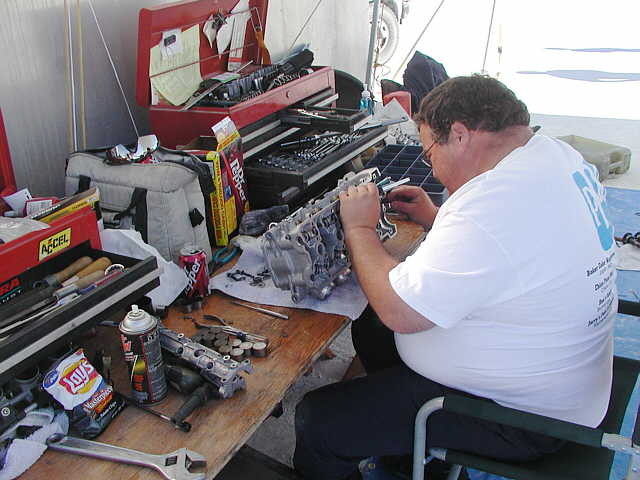 Mark and Alan pulled the motor, and Patrick inspected every part of our new head to make sure it was ready to run. Unfortunately, the whole plan ended when the old head was pulled from the motor. The problem turned out to be a wrong sized head gasket. A stock gasket had been used instead of the over bore one that was needed. This resulted in damaged pistons & head, and the end of World Finals for our car. It was amazing it ran as well as it did considering the damage. SouthWest SuperBikes who had helped with the motor was pitted next to us, and they felt bad when they saw the problem. On the plus side, they had managed to set a couple of motorcycle records they had shot for. Cathy and Van Butler also picked up some records there. Saturday Morning we shot some publicity shots of the car, and finished packing. Then Alan took Mark and Patrick to Blue Lake for scuba diving while I timed the last day of the meet and packed up the timing gear. Mark and Pat drove home Saturday Afternoon, while Alan and I took the redeye drive back Saturday night. 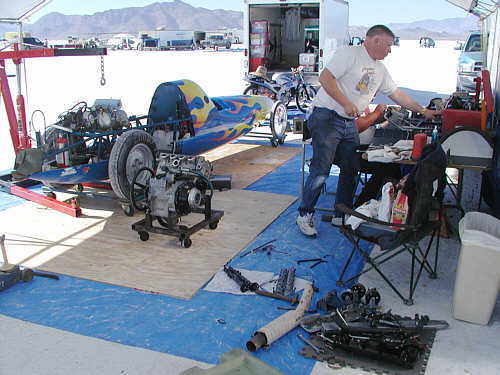 Richard promised to have a motor to us for the race November 15-16, and hopefully we can end the season on an up note, with Alan getting a record, and the team finishing top ten for the association and #1 for the Gear Grinders.